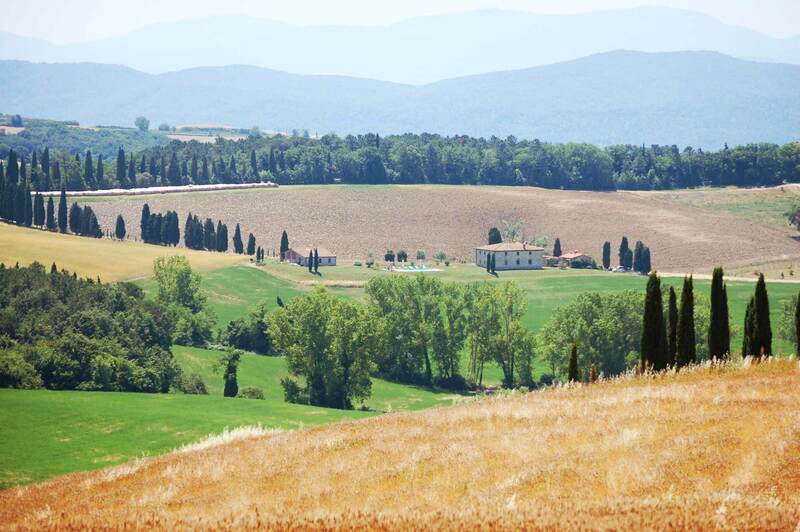 Villa le Ginepraie is located in Volterra , on a hill where you can see a landscape with fields, woods , ponds at 360 degrees. The property was part of the farm Pignano and has been restored while maintaining all the characteristics of the farmhouses in Volterra. This is a typical villa in Volterra has 3 bedrooms on the first floor and 2 on the second. 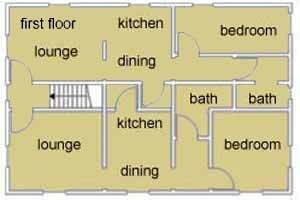 5 are the bathrooms, 3 kitchens and 3 living rooms all with a working fireplace , a total of 400 square meters . A wonderful balcony with large table can be used for lunches and dinners on rainy days , guests can dine while enjoying spectacular sunsets in the beautiful panoramic terrace. Paola and Valerio , the owners of this villa are at your disposal for any request for quote. 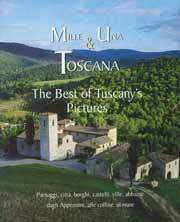 For your holidays in Tuscany rent whole Villa with pool in Volterra, near San Gimignano and the Chianti. 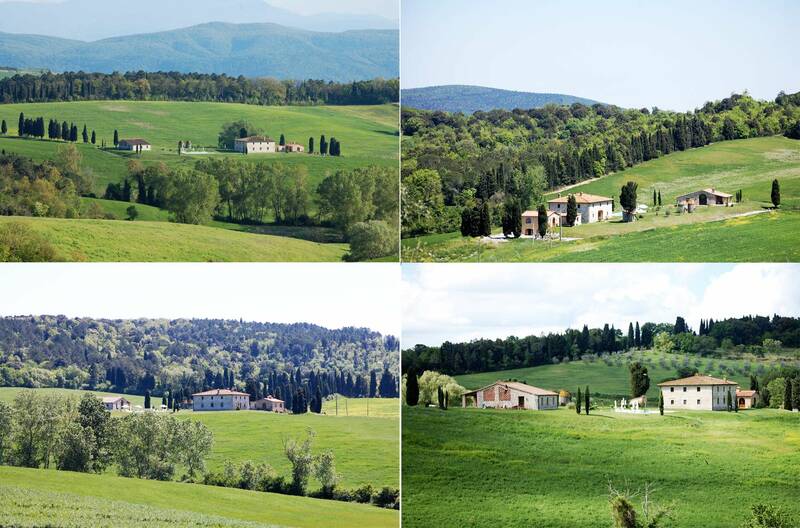 As you can see in the aerial photo, the villa is surrounded by nature through fields, woods and hills, through 800 meters of white road with cypresses, you reach this property with 5000 square meters of garden, with a beautiful rooftop pool and house of 400 square meters. The villa is on two levels, has been lovingly restored while maintaining the wide open spaces that characterized it, so every room is very spacious and has its own bathroom. The villa can accommodate 12 people, with 3 bedrooms with a bathroom, a kitchen, a living room and a loggia on the ground floor and 2 bedrooms, 2 bathrooms, 2 living rooms with working fireplaces and other 2 kitchens on the first floor. Given the fortunate position of this Villa, who will rent in full, in addition to enjoying total privacy, as there is no house nearby, you can also see many wild animals: in the morning and in the evening you can watch the deer, pheasants, wild boars and foxes, among birds, hawks and herons. The cities that you can visit are Volterra, the city of alabaster, which is only 15 km, San Gimignano is famous throughout the world for its towers 15 km, Certaldo high where a gem is said to be born Boccaccio 18 km, Colle Val d’Elsa, the city of crystal. 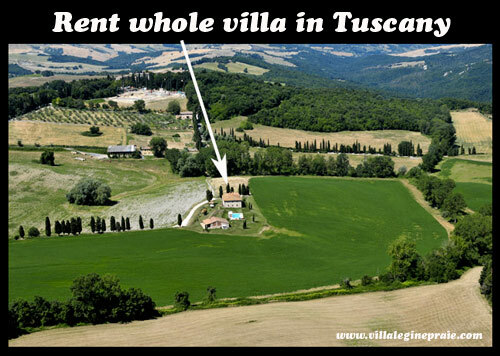 The villa is also near to Chianti Area. 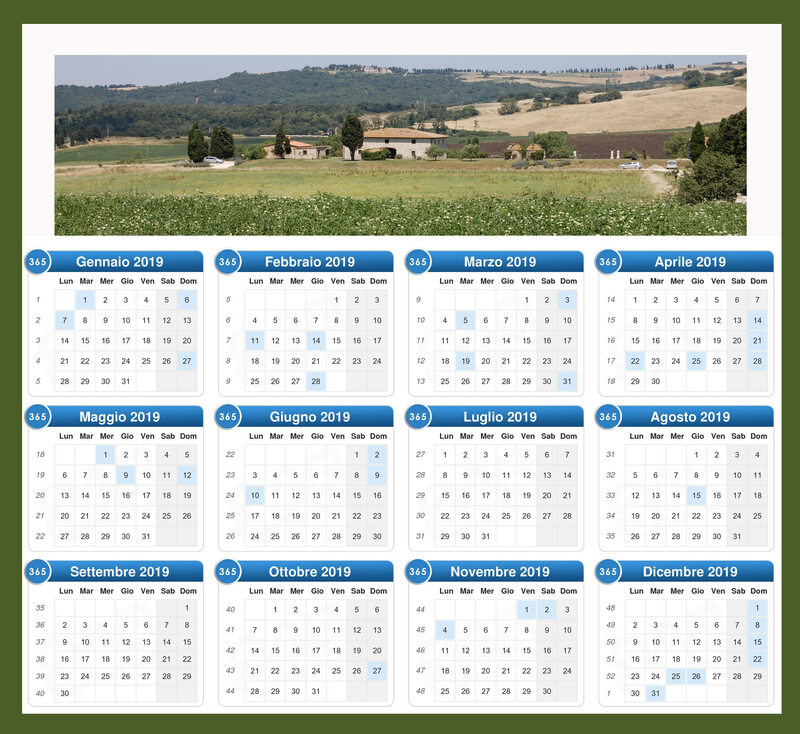 Villa rentals in Volterra, for weeks or even for a weekend in the months of April, May, September and October, while in the months of June, July, August propose the rent for one or more weeks from Saturday to Saturday. 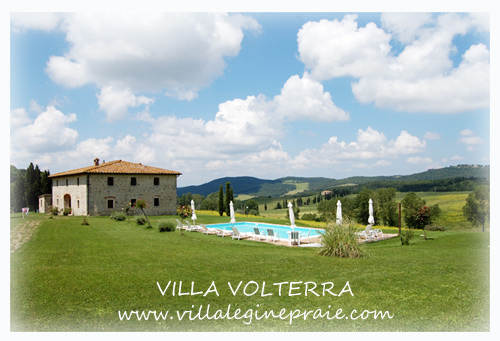 This villa is located only 12 km from Volterra reached by the convenient highway 68 connecting Volterra to Colle Val d’Elsa, is about an hour from the ‘airport of Pisa and Florence one. 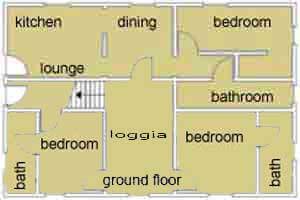 The villa has a maximum capacity of 12 people that can be distributed as follows: 6 persons 6 persons on the ground floor and the first floor. The villa has been restored maintaining all its typical characteristics, such as ceilings on the ground floor left with the “Volterrane” and those on the first floor with massive wooden beams. The central part of this villa in Volterra is the loggia with large wooden table that can accommodate up to 12 people. During the hot summer days the light breeze will entertain you and as you can see from the picture, you can relax in the beautiful swimming pool, set in a garden of 5000 square meters. This villa is located in Volterra, so you can participate in the many events that take place in this medieval town [events Volterra]. Paola and Valerio owners of this typical farmhouse in Volterra are at your disposal for any need, and to help you better organize your holidays in Tuscany.